The Vegan Society has obviously gotten a significant critical reaction to its explicit rejection of veganism as a baseline moral principle as represented in its “You don’t have to be vegan” campaign. The Vegan Society has been going in the wrong direction for a while now. In 2011, the Society banned me for promoting veganism after I started a discussion you can read here. First of all, Drake made those comments 62 years ago. Veganism was a relatively new idea back then, particularly in the West. So was racial equality. So was the equality of women. So what? It’s 2014 now. Second, no one disputes that we cannot make up anyone’s mind for them. People have to make up their own minds. And that is precisely why we must be crystal clear that veganism is the moral baseline as it represents the only rational response to recognizing the inherent value of other animals. We must be crystal clear that veganism is a fundamental matter of justice. 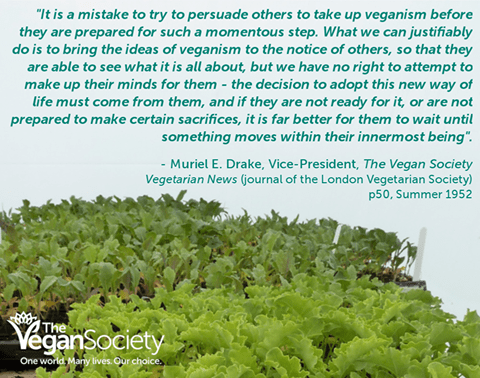 The Vegan Society thinks that our inability to make up anyone’s mind for them means that we should not promote veganism as a fundamental moral principle. That’s completely wrong and we can see that by looking at the human context. We cannot make up anyone’s mind for them about the equality of women. Does that mean that we should be characterizing accepting their equality as a “momentous” decision about which we cannot take a clear, strong, and unequivocal moral position? Does our inability to make up anyone’s mind for them mean that we should not be crystal clear as a fundamental matter that patriarchy is morally wrong? We cannot make up anyone’s mind for them on veganism or any moral issue. But that does not mean that fundamental moral principles cease to be such or that we do not have an obligation to be crystal about these moral issues. On the contrary. Our obligation to be clear is itself clear, and is more compelling—and not less—to the extent that discrimination is pervasive. Read those words. Think about them. Seventy years later, The Vegan Society says: “You don’t have to be vegan to love vegan things” and transparently promotes moral relativism—it’s all about optional choice—and the idea that we should not promote veganism as a fundamental moral principle. It’s 2014. It’s easy to go vegan. It’s better for human health and for the health of the planet on which all life depends. But, most importantly, it’s the morally right thing to do. It’s what we owe other animals. Veganism is a matter of justice. And it is our obligation to make that crystal clear in creative, nonviolent ways. The Vegan Society has recently decided to explicitly disavow the idea of veganism as a moral imperative. In this essay, “CEO” Jasmijn de Boo explains why here. It is about helping people in a constructive and caring way to put into practice an idea that most people already have: that animals matter morally and that we have moral obligations that we owe directly to them. CEO de Boo sets up a false choice between making people feel “guilty” or promoting a most flexible version of “flexible veganism.” Those are not the only choices, unless, of course, one wants to defend marketing a “flexitarian” approach, which is what the “new” Vegan Society has clearly opted to do. Imagine where the civil rights movement would be if we had decided that market “research” showed that people did not like being made to feel “guilty” about racism so, instead, we promoted a “treat a person of color nicely when you feel like it” campaign. CEO de Boo explicitly adopts the language of the “happy exploitation” movement, claiming that many people won’t go vegan “overnight.” Well that’s no surprise, particularly given that none of the large animal charities—and now The Vegan Society—promote veganism as a moral imperative that grows out of a consistent moral commitment to justice and nonviolence, which, by the way, is explicitly what Donald Watson promoted. But the issue is not whether anyone does anything “overnight.” The issue is whether The Vegan Society should promote a clear moral message that veganism—whether achieved “overnight” or not—is the only rational response to the idea that most people already accept: that animals matter morally. The Vegan Society says that it will not promote that idea, instead opting for a celebration of non-veganism. CEO de Boo writes: “Everyone is now free to embrace veganism, not only those who are already vegan, but those who are thinking about it and want to start bringing more plant-based dishes into their diet, or replace their leather shoes with vegan versions.” That is an even looser version of “flexible veganism” than something like “vegan before 6,” which, although nonsensical, promotes not consuming animals for at least a part of the day. The Vegan Society under CEO de Boo has joined the other corporate charities that have abandoned the idea that there are meaningful moral principles that we are obligated to respect. But what these corporate charities do not seem to understand is that you don’t effect a shift in moral paradigms by rejecting the idea that moral principles matter. Seventy years separate Watson from CEO de Boo. The word “progress” does not come to mind. The Vegan Society has just joined the “happy exploitation”/”flexitarian” movement. Please: a moment of silence for the memory of Donald Watson.